I've been seeking out easy ways to make really easy dinners that will add more vegetables to my life. One thing I've started doing since my return from Ontario (where I ate non-vegetables with abandon) is eating salad before making dinner. Using the easiest prepackaged things: a bag of pre-washed baby spinach, a bag of broccoli-carrot slaw, roasted sunflower seeds and store-bought dressing. It may not be the most environmentally friendly salad in town, but it indeed does result in more vegetables inside my body. I also make an easy dinner which is called Canned Soup Plus Frozen Vegetables. YUM. 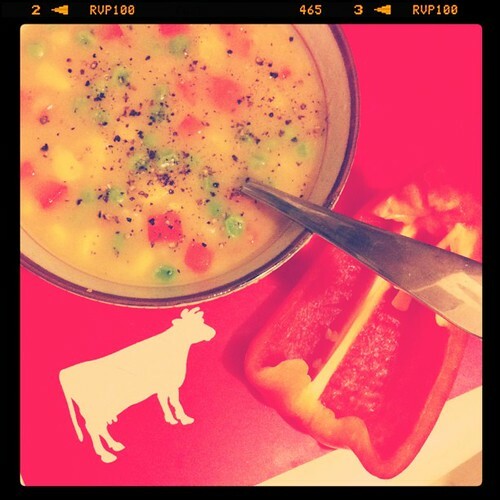 This particular one consists of Habitant pea soup, with frozen corn and peas and a chopped up red pepper. This dinner contains a satisfactory amount of veggies, and includes a wealth of BPA as well. Hrmmm. So the question is, does the good outweigh the bad? Or vice versa?